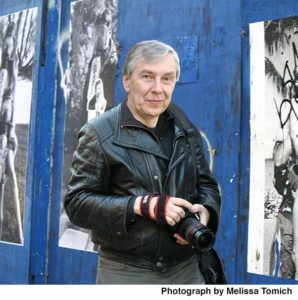 Donald Lokuta’s career as a photographer, painter, teacher, and historian spans over forty years. He has authored and co-authored several books and has written many articles about photography. His own artwork is published widely and has been included in over 300 exhibitions. Lokuta’s works are in numerous permanent collections such as the Art Museum at Princeton University, the Bibliothèque Nationale in Paris, the Museum of the City of New York, the International Center of Photography in New York City, Lehigh University in Bethlehem, The New York Historical Society, the National September 11 Memorial & Museum in New York City, the Nelson-Atkins Museum and the Smithsonian Institution (National Museum of American History) in Washington, DC. Lokuta has had solo exhibitions at Sarah Morthland Gallery in New York; the New Jersey State Museum in Trenton; the Newark Museum in Newark, New Jersey; Parsons School of Design in New York City; Dabac Gallery in Zagreb, Croatia; Srecna Gallery in Belgrade; the Urban Arts Space, The Ohio State University, Columbus, Ohio and the San Antonio Museum of Art. Lokuta’s participation in group exhibitions includes the Museum of Modern Art in New York City; the New York Historical Society; Lincoln Center for the Performing Arts in New York City; the Columbus Museum of Art in Columbus Ohio; the Front Room Gallery in Singapore; the Nelson-Atkins Museum in Kansas City; the Zimmerli Art Museum. Rutgers University, New Brunswick, NJ; the Madison Museum of Contemporary Art in Madison, Wisconsin; Galleria Nationale d’Arte Moderna, Rome, Italy and the Norton Museum of Art in West Palm Beach, Florida. Lokuta is the recipient of twelve grants for his photography, including four prestigious New Jersey State Council on the Arts Fellowship Awards. Donald Lokuta earned his Ph.D. at The Ohio State University in Columbus, Ohio, received his M.A. at Montclair University and B.A. at Newark State College in New Jersey. Lokuta guest lectures extensively and is a Distinguished Professor Emeritus. Lokuta’s knowledge of the history of photography is extensive and he has curated many exhibitions. Donald Lokuta is represented by: HPGRP Gallery, 434 Greenwich St, New York, NY 10013 and ARS (Artists Rights Society) 65 Bleecker Street, 12th floor, New York, NY 10012.